Making Understanding Solar Power Easy! Welcome to Understand Solar, where we believe that understanding solar power does not have to be complicated. Whether you are searching for the best professional solar installer in your area, reviews of the best solar panels and products, or simply more information to help you understand solar energy, you can find it all right here at Understand Solar. Find a wide range of the best solar information and guides that we have created in order to help make understanding solar power easy and straightforward. Read on, and explore our site, to learn more about the amazing world of solar power today. So, You Are Interested In Understanding Solar Power? And why wouldn’t you be: residential solar is big, it’s now coming online as cost competitive with other sources of electricity, and your solar panel savings could be enormous. Which begs the question: why haven’t you already installed solar panels? 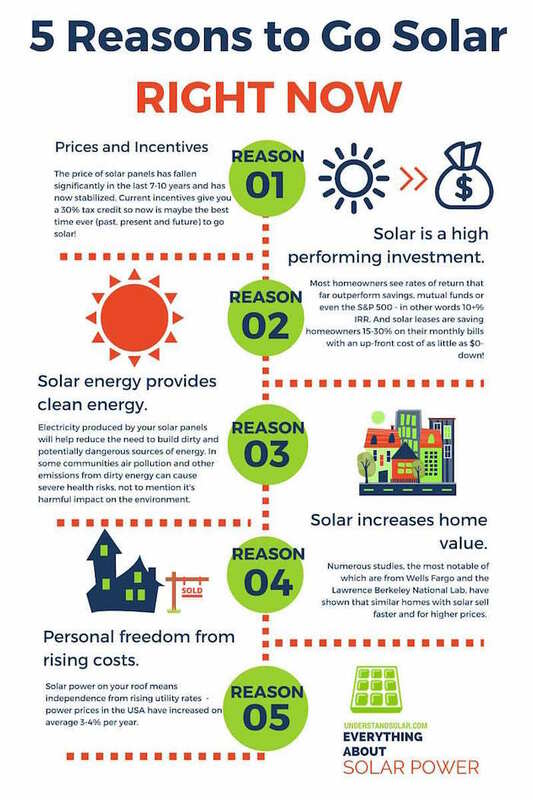 See the infographic below for 5 top reasons that you should consider going solar right now! 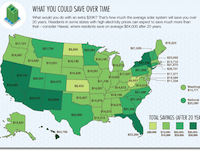 Solar panel cost has plummeted 70% in the last 5 years. Even without major advances in solar panel output, solar has become a cost competitive energy source. Powering your home with solar is now cost competitive with energy produced from your coal-powered utility. The cost of solar energy is already cost competitive in Utah, which is about the last place in the USA we’d expect this to happen (besides Wyoming). Numerous options now exist to pay for solar panels including $0-down leases, innovative solar loan options, as well as cash purchasing. You can now afford to put solar panels on your roof, with the punch-line that it’s the only home improvement that pays for itself. Solar FAQ – Answers to real homeowner questions about solar. What is a kilowatt, kilowatt-hour and peak kilowatt (kw, kwh, kwp)? Hate paying your utility bill? 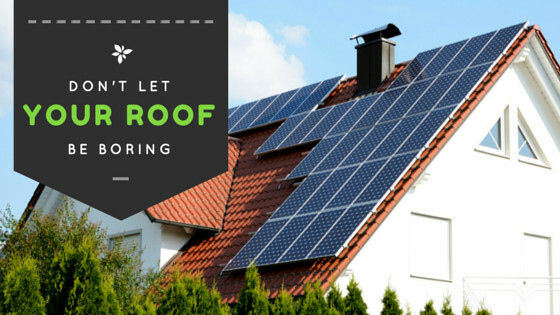 Want to power your home from clean, non-polluting sources of energy? Want to help create a more robust, distributed energy grid to power the future of the USA? We encourage you to take the first step by getting a free solar estimate to see how much you can save and to discuss your options with a local solar installer. You may be in an excellent solar market and just not know it. Start now by getting a free solar quote, and more information about solar panels and installation costs in your area, by entering your zip code below.